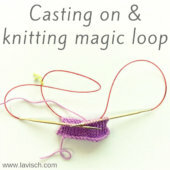 There are many types of projects where knitting in the round may be easier than knitting flat back and forth followed by sewing the pieces together. Think of socks, hats, sleeves of sweaters, round shawls etc. 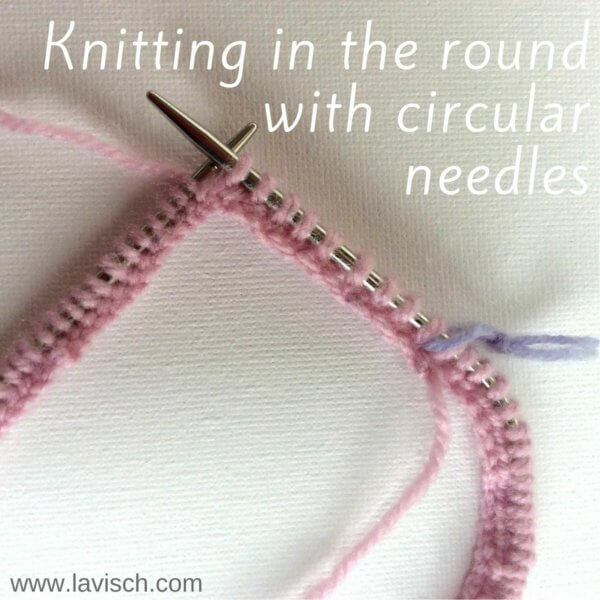 There are roughly two different ways to knit in the round: Double pointed needles (dpn’s) or circular needles (circs for short). Most people have a strict preference for one variant or the other. My preference is for circulars; I once worked with dpn’s, but it felt like I was wrestling a hedgehog! For me using circs also saves the number of different knitting needles I need, because I use my circulars also to just knit back and forth. Note that some knitting techniques are less suitable for knitting with circular needles. Think for example of those who are used to clamping the needle under the arm. But how to go about choosing circular knitting needles? In this post, I want to give you some background information about the different types of circulars. This because, as you can see in the picture above, there are really a lot of different types! Choosing circular knitting needles that are the right ones for you and your projects can, therefore, be a bit of a challenge. I will of course also talk about what to look for when you are going to try knitting with circular needles. 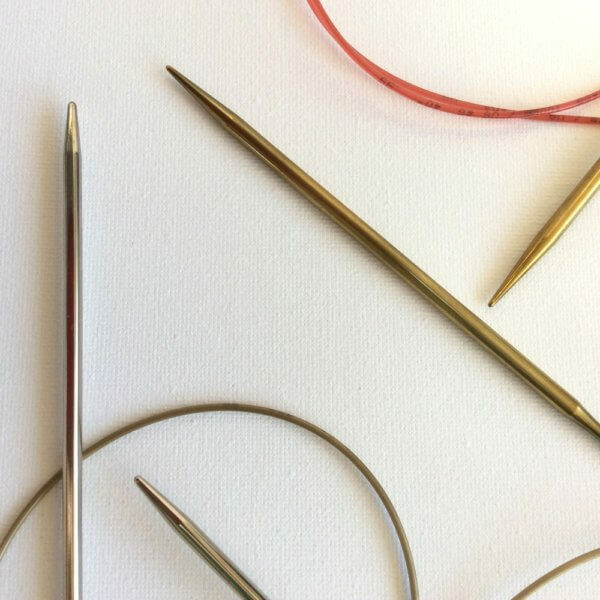 Indeed, there is nothing as personal as a circular needle: If your knitting needle is not the right one for you, the experience can be less pleasant than knitting should be. Below I will elaborate on each of these points as they are very much of importance when choosing circular knitting needles. Circular needles can be made from various materials. Commonly found are needles made from wood, bamboo, nickel plated, copper finish, plastic, and aluminum. Wood and bamboo have more drag when knitting than the other materials. Because of this, it is not my preference: For me personally, the smoother the better! The picture above shows two favorites from my personal collection: The silver with gold cable is a regular Addi circular needle, the copper-colored circular needle with the red cable is an Addi Lace needle. The latter has a special coating to make it a tad less smooth than regular Addi’s to make it easier to work with very thin yarn. In the picture above you can see the difference in points between the two types of circular needles very well. The lace needle is significantly sharper than the other. Which variant is preferred is again very personal and depends both on the type of project you want to knit, and your knitting style. 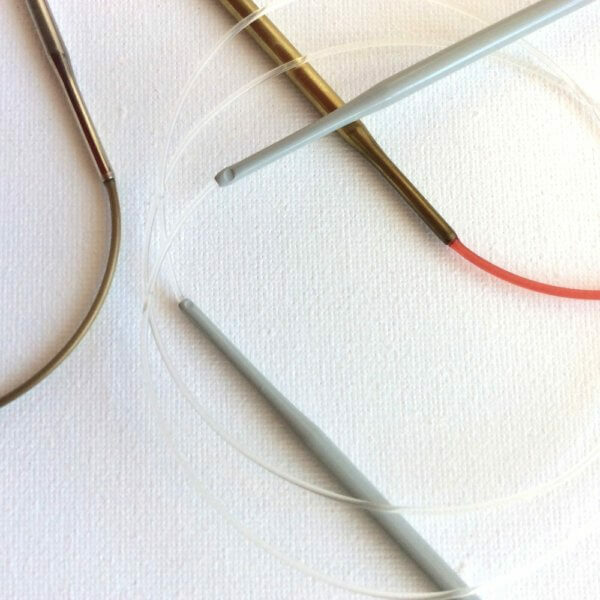 In the picture above you can see the difference between the connection of the more expensive Addi needles compared to the much cheaper Wibra circular needle: the connection on the Wibra needle is clearly less smooth. Moreover, I have no problem with Wibra needles: They are nice and pointy, have a good flexible cable and are excellent value for money. However, depending on the type of project and your personal knitting style, the connection of the needle to the cable can be a problem. With very thin yarn, or if you knit very tight, the yarn can snag behind the edge, which can be very annoying when knitting. The various cables that you see in these photos are all made of different materials. As a result, there are also differences in how supple and flexible the cables are. This, in turn, has an effect on how easy and enjoyable different types of circular knitting can be done with them. I myself have not yet come across a cable too flexible for my tastes. More the opposite, with the cable being too stiff. This of course again depends on your own preferences. Update December 13th, 2017: I have found circular needles with a (to my taste) too flexible cable, my 3.75 mm Kollage square needles. I like the needles themselves, but the cable is the limpest noodle I have ever encountered! 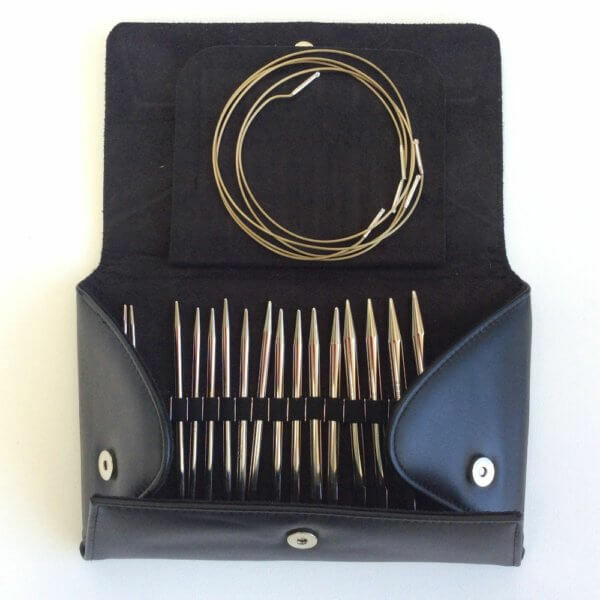 When you have the need for multiple cable lengths, an interchangeable needle set with loose points and cables like the one below could be just the thing for you. I know this Addi Click set was for me the best investment in knitting tools in years! 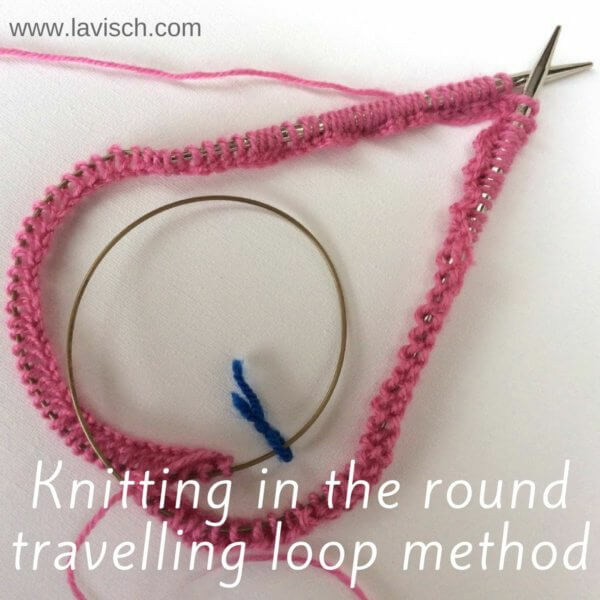 If you have no experience with knitting in the round with circular needles and don’t know yet what you prefer: If possible, go and visit a friend who already has several and try them out before you invest yourself. 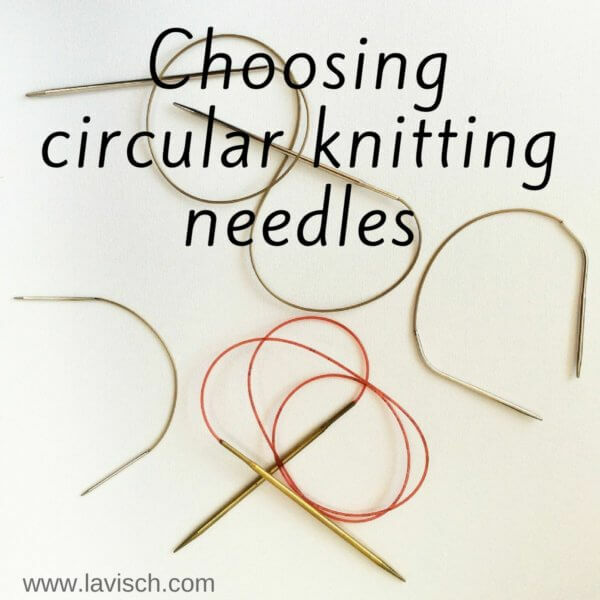 Choosing circular knitting needles this way is a lot more budget friendly than buying them all!